I received a lot of really nice feedback on my last mix Music for Stargazing Vol 1. Thanks for all of the nice comments. One listener asked if I could go from night to day and do a sunrise mix. So, per your request, I would like to present: Music for Sunrise. This mix, like the last, was inspired by the annual trips I take to a lake cottage in northern Wisconsin. Besides putting together music mixes for looking at the night sky I had also, over the years, collected tracks to play in the early mornings. The tracks collected for this sunrise mix are ambient in nature--songs that give a sense of an awakening dawn sky. Most of the tracks also have a Classical Music "sound" to them. I’ve always associated early mornings with Classical Music and that first hot cup of coffee. I also included a few very slow, quiet Classical works in the mix as well. 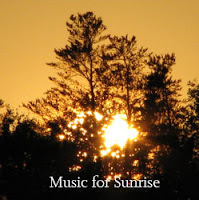 Music for Sunrise was originally inspired by the work of Harold Budd. He is an amazing piano player with a massive body of excellent ambient compositions. The album he did with Brian Eno, Ambient 2: The Plateaux of Mirror, was my first introduction to him many moons ago. If any album evokes “dawn” this beautiful work would be it. So, the next time you awake at dawn, grab a hot cup of joe and play Music for Sunrise. I hope you enjoy it.